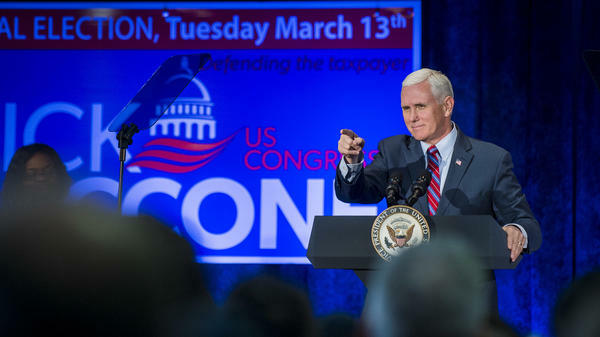 Vice President Pence speaks during a campaign event for Pennsylvania congressional candidate Rick Saccone in February. Pence is playing a big role in Republicans' midterm election campaign. Whatever his long-term ambitions may be, Hershey said Pence has shown a skill for falling in line and staying on message — and not stepping too far out of Trump's shadow. In addition to his statements and moves on immigration, President Trump has also been holding a lot of campaign rallies lately. Last night, he was in South Carolina, where Governor Henry McMaster faces a primary runoff today. PRESIDENT DONALD TRUMP: Vote for victory, and vote for Henry. He is a great, great gentleman. KING: While the president has been holding his raucous rallies, Vice President Mike Pence has also been holding dozens of campaign events and fundraisers across the country. NPR's Sarah McCammon recently traveled with Pence as he worked to get Republicans elected this year and build up some political capital of his own. SARAH MCCAMMON, BYLINE: Days before the president visited South Carolina, the vice president was there. He was stumping for Governor Henry McMaster, but he could have been campaigning for Trump himself. VICE PRESIDENT MIKE PENCE: You know, you look at the last year and a half in this administration, I've got to tell you, there's only one way you can describe it. MCCAMMON: Speaking to a crowd near Myrtle Beach, Pence touted his boss's achievements. PENCE: It's a little more than 500 days of action, 500 days of accomplishment. It's been a little more than 500 days of promises made and promises kept. MCCAMMON: He talked about tax cuts and job growth, the issues GOP leaders want to focus on. But amid a heated debate over the separation of families caught crossing the U.S. border illegally, Pence only briefly alluded to immigration, prompting familiar chants from the crowd, of, build that wall. UNIDENTIFIED CROWD: (Chanting) Build that wall. Build that wall. Build that wall. MCCAMMON: Earlier in the day in Pittsburgh, at a fundraiser for Congressman Keith Rothfus, Pence followed a similar script. PENCE: I bring greetings from President Donald Trump. MCCAMMON: Unlike the president, who's has sent mixed messages on immigration policy in recent days and often veers away from Republican talking points, Pence is known for being disciplined and avoiding anything that might steal the spotlight from Trump. He's been traveling the country fundraising for Republican candidates and organizations, sometimes drawing several-million dollars in a single trip. And he's holding events to urge GOP voters to turn out in November and hold onto their congressional majorities. Marc Lotter is a consultant to the Republican National Committee and aid to Pence. MARC LOTTER: Republicans are very energetic right now. They see the positive momentum going on with the economy. They see the leadership that's being shown by the president on the world stage. They want to keep that. MCCAMMON: As the election draws closer, Lotter says the vice president will spend more time holding campaign rallies in strategically important areas both for members of Congress and for Republican governors, several of whom face tough races this fall. Much of Pence's midterm campaign travel is funded by his leadership PAC the Great America Committee. Its creation has fueled speculation about Pence's own political ambitions. Lotter says the vice president is focused on promoting President Trump and electing Republicans this year. LOTTER: I would say that any vice president - regardless of party - their political future, whatever that may or may not be, solely lies on the success of the president that they serve. And so in this case, the vice president is solely focused on the president and the president's agenda, and that success will determine everything for the vice president. MCCAMMON: Pence has plenty to gain from the reputation and relationships he's building while stumping for Republicans across the country. But Marjorie Hershey, a political scientist at Indiana University, notes that Trump is known for demanding loyalty, and so are GOP voters. MARJORIE HERSHEY: That isn't a choice for Vice President Pence to make. He either is wholly loyal to the president, or he doesn't have a future within the Trump party. MCCAMMON: Whatever his long-term ambitions may be, she says Pence has shown a skill for falling in line and staying on message and not stepping too far out of Trump's shadow. Sarah McCammon, NPR News, Washington. Transcript provided by NPR, Copyright NPR.